WHERE TO PUT THOSE PLASTIC BAGS! DOES YOUR VEGETABLE DIRT NEED A DETOX? 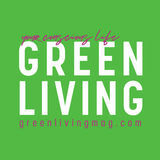 Green Living Magazine highlights educational, fun and M a g a z i n e thought-provoking stories and perspectives on eco-conscious issues that impact the way we live, work and play. We cover Your “green” conscious life the latest news in products/services, health, wellness, travel, business, housing and more in order to champion sustainable practices and choices. Our monthly lifestyle M a g a z i n e magazine has widespread reach throughout the southwest. We are looking for partners who align with our mission. partnerships Partnerships are the catalyst for our thriving eco-conscious community. Like our readers, our partners share our commitment to nurturing the concepts of sustainability and eco-conscious living. Join us to grow, nurture and promote green endeavors and initiatives within our community, and together we can move our planet and people toward a more sustainable future. Simple Solutions Summit Partnership In partnership with Keep Phoenix Beautiful. This is a limited partner program. Please call for information regarding this special event in April 2019. Videos that are customized to fit your needs. 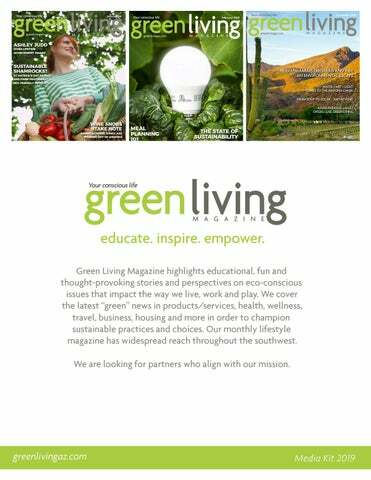 Green Living Magazine will place the video on our home page, along with collaborating with you on a customized social media campaign to generate traffic, brand awareness and leads. Please call for an estimate. w BLOG CONTENT content marketing When planning a blog post, pick topics that can be addressed in 500-800 words or less. Please focus on one topic and send to our editor for review. Please call for an estimate. All dimensions shown are width x height. For full page ads, keep all text and graphics within a 0.25” margin. Page size – 8.375" X 10.875"
For print & digital ad design, please call for an estimate. THE CO MPLET GUIDE E TO COM POSTIN G!